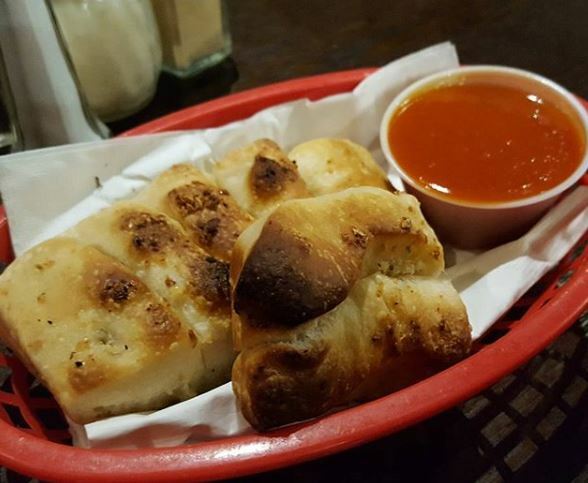 Always nice when your meal starts off with bread like this. Three words: sesame seed crust. Without it, unfortunately, Esposito’s is little more than average pizza. Not bad by any means, but remember the area I live in. I could go a mile in any direction from my house and probably run into five pizzerias. I actually never liked Esposito’s until we started requesting their sesame seed crust. This simple modification of your order turns the entire pizza around. The crust becomes more crisp, with the seeds adding little pockets of crunch and flavor. The remaining crust after working your way through the slice is good enough to standalone as a breadstick. I skip over their regular pies and go right for the specialties (they used to have a pie with sliced potatoes and Fontina cheese which was to die for). They have one with fresh mozzarella, arugula, prosciutto, shaved Parmesan, and spicy olive oil. It’s excellent. The right combination of crispy, creamy, melty, savory, and spicy. That hot oil packs a punch. This time, we went for meals instead of pizza. Esposito’s is one of a few places that do a chicken parm alla vodka sauce. It combines two of my favorite things: crispy fried chicken cutlets and creamy vodka sauce. 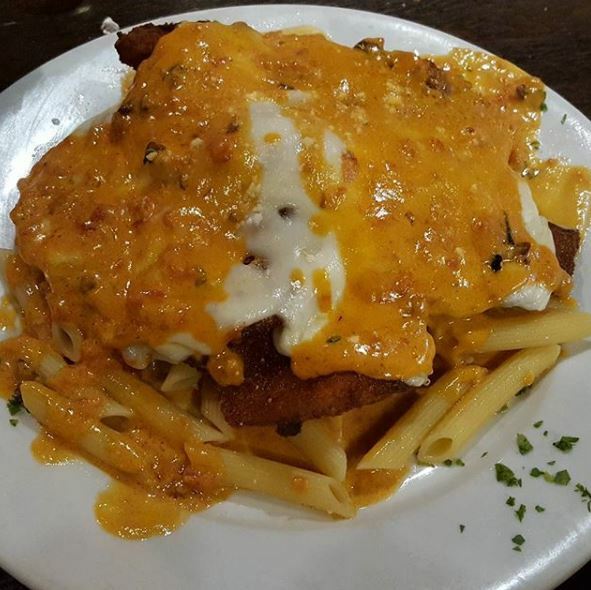 It was $17.95, so a little on the high side, but the portion was gigantic: three large cutlets, smothered in mozzarella and sauce, served over penne. It was so large, I could not finish it. I used the leftover cutlet in a sandwich days later. There was even some left after that. When you consider meals come with salad and homemade bread, I guess the price is not so bad after all. Mom and my friend both had pasta bolognese. We actually went there specifically because my mom was craving that particular meal. Esposito’s is the only place she will order it from. I forgot to take a picture, but again, it was gigantic. She will probably get three meals out of it. They both loved what they had. 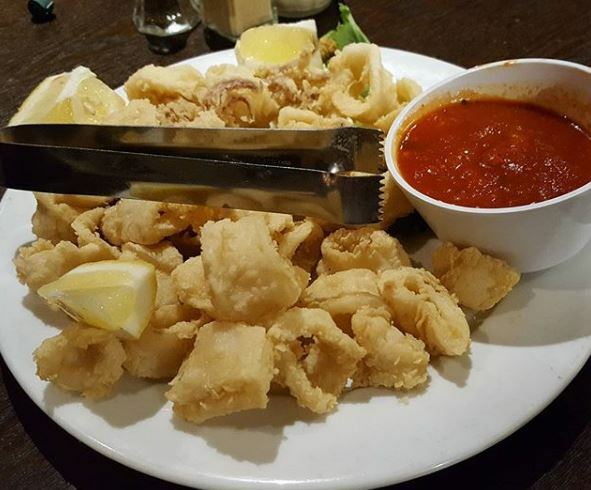 We started out with a fried calamari appetizer. It was good. Light, crispy, and not greasy at all. With the amount of food we ended up getting (and a couple of baskets of those complimentary breadsticks), an appetizer was totally unnecessary. Oh well. To add to the gluttony, my friend spotted a pizza covered in what looked like a pesto oil on the way in. He ordered a slice to have before the meal. It was forgotten by the waitress and showed up with his entrée (they nicely gave it to us on the house) and he declared it was one of the best slices of pizza he ever had. I think it is safe to say we all left stuffed. Beyond stuffed. Esposito’s is primarily a takeout crowd, but they have a nice dining room. It has a pretty good atmosphere. Not much decor to speak of, but dark tiles and dim lights make for a cool restaurant feel. It’s small, so be prepared to wait for a table if you are going on the weekend. This was a Thursday night and every table was taken. 4 out of 5 stars.